While Will Grigg has enjoyed getting his goal account for the season up and running, he wants Wigan Athletic to kick on from their ‘okay’ start. Latics return to the DW Stadium tomorrow after two games on the road in which they demolished Stoke 3-0 before a controversial 1-0 defeat to QPR last weekend. Grigg, who bagged his first goal this term against Nottingham Forest, scored twice in the win at the bet365 Stadium, and the Northern Ireland striker is pleased to see manager Paul Cook stick with the attacking style in the Championship that served them well in League One last term. But Grigg is being realistic in his assessment of what lies ahead, and admits not everything is going to go his side’s way this season. And he thinks Latics should have more than the seven points they’ve got to show from their opening five league games. “It looks like an okay start, from our point of view it’s been good but we feel like we could have had points on the board,” he said. 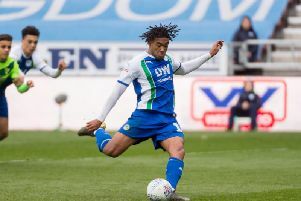 Having warned of the task that lies ahead for Latics, Grigg thinks they should be aiming for a lot more than simply just to stay up this season having earned promotion last term as League One champions. He points to last weekend’s loss to QPR, the Loftus Road outfit’s first win this season, as to why nothing should be taken for granted, but thinks Latics can play with confidence each week. “It’s one of those things, people from the offset think when you come up your whole aim is to stay up and that’s obviously the case but you want to do as well as you can,” he said. “I don’t think we’ve played a game where we’ve felt there’s anything to fear and I think for the majority of games if not all of them we’ve been the better side and there’s nothing to fear. It’s an old cliche but we’re going to take every game as it comes. “I think you have to in this league, there’s so many good teams it’s just one of those things, you have to take each game as it comes. You go to QPR at the weekend who’ve lost four out of four and you get beaten so it’s one of those leagues. Being back in the Championship has also given Grigg a big boost, with his inclusion in Martin O’Neill’s Northern Ireland squad last week. The side play against Bosnia and Israel next week, and Grigg says being in a league which has a break for internationals has cleared the way for him to grace the stage. “It makes a massive difference. Sometimes you’re missing two games in a week, potentially three, so it makes it a lot easier and it’s good to be back,” he said. “It’s something I feel has been coming for a while and I pulled out of the last squad. “I spoke to Michael and it was a decision we had to make because of a double header we had over Easter and I felt we were in the stage of the season where I couldn’t risk missing two games.